Writer and actor Dr Stuart Hepburn is a visiting lecturer in Screenwriting at the Universities of Stirling and the The West Of Scotland. His latest stage play ” The Empty Charcoal Box” will open the Oran Mor’s “Play Pie and Pint” Autumn season on Mon 28th of August. Along with the Eden Court Theatre he is currently organising the Scottish Tour of his stage play “The Beaches Of St Valery” which gained Four Star Reviews in the Spring 2017 season of the Oran Mor’s “Play, Pie, Pint” series. He was Story Producer at BBC Scotland’s River City from 2015-16, being responsible for the team storylining 52 hours of the long running drama. He recently appeared as John Anderson in the series. From 2006-15 he was a Senior Lecturer in Creative Writing and Contemporary Screen Acting at University Of The West Of Scotland. He is a Fellow of the Higher Education Academy, and in 2015 was a awarded a PhD in English Literature through the School of Critical Studies at the University Of Glasgow. Stuart’s areas of expertise are the practice and theory of Stage Writing and Team Writing For Television, Screen Adaptation and Contemporary Screen Acting. Stuart was a member of the creative team who adapted, storyboarded and wrote 26 Episodes of Mairi Hedderwick’s “Katie Morag” series for Move On Up TV and BBC Scotland . Nominated Best Children’s Screenplay in the British Screenwriters Award. 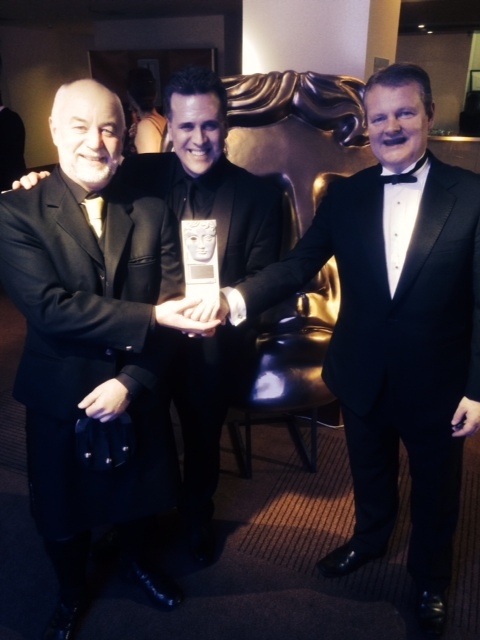 Here is a pic of Stuart with fellow team writers Sergio Casci and Martin McCardie with Katie Morag’s Scottish BAFTA. As a creative writing developer, tutor and mentor, he has worked for The Edinburgh International Festival Network, The Arvon Foundation, Clackmannan Council, Screen Academy Scotland, Moonstone, Movie Makars, Highlands & Islands Enterprise and UHI at Sol Mor Ostaig on Skye. He was on the board of the Traverse Theatre for 11 years and it’s chair for 5. Here is a 4 star Review of a recent presentation he gave on the “Traverse Through Time” series at Summerhall in Edinburgh in August 2014. As an actor he appeared in the first two Series of “Lip Service “for BBC 3 as the father of Laura Fraser who went on to star as Lydia in HBO’s “Breaking Bad.” Before that he played Sam Heughan’s father in “River City” who then went on to star as Jamie Fraser in Starz “Outlander”. He makes no claim to fame other than that his screen progeny have completely eclipsed the career of their screen father. While at UWS, Stuart headed up the innovative StudioLab collaborative crossover project. Here is a video made by UWS students of the StudioLab Process. Here is a short Flip Video where he talks about his Screenwriting Career with Alasdair Smith of Skillset Scotland. Stuart has been acting and writing since graduating from the University Of Stirling in 1982. From 2006-15 he was a Senior Lecturer in Screenwriting and Performance at University Of The West Of Scotland. He won two Star teaching awards and was nominated four times for his innovative teaching while at UWS. He was on the Reading Panel and a member of the Board of The Traverse in Edinburgh for 11 years, and was it’s Chair from 2001-2005 . He helped to support the creative team who nurtured the talent of writers such as David Grieg, Gregory Burke and David Harrower. He has worked with Directors such as John Tiffany, DominicHill, Bill Gaskell, Philip Howard, Kenny Ireland, Ian Brown and Ian Woolridge. As an actor Stuart has appeared at theatres such as The Royal Lyceum, The Citizens, The Traverse, Dundee Rep and The Tramway , and won a Fringe First for his portrayal in “Hanging The President”. He has worked with companies such as TAG, Communicado, Cumbernauld and The MacRobert in Stirling. He has toured with stageworks extensively from Achiltibuie to Battersea. He has written two feature films: “The James Gang” (Revolution Films) starred John Hannah and Toni Collette, and “A Love Divided “ (Paralell Films) ,which achieved five Irish Film and TV Award Nominations. He has written four stage plays, and over 80 hours of Television, His latest stage play “The Beaches Of St Valery” was performed at Oran Mor in Glasgow in March 2017. He was the winner of the Writer’s Guild Award for Drama for his work on Taggart, for which he has written 17 Series. He was a leading writer and Creative Story Consultant for BBC Scotland Drama “River City” from 2007-9. He is been a visiting lecturer in Creative Writing at the Universities of St.Andrews, Stirling and Glasgow. His main research interests are in the areas of Creative Writing in Adaptation, Practice Based Research, Team Writing for Television, and Cross- Programmatical Creative Synergies. Hi Stuart, thanks for the link on Twitter – I couldn’t reply as you don’t follow me on there. Aye no worries. Just email me some questions. Not sure if that comment leaves my email address – melville.jonathan@gmail.com should do it. I just tried to mail you via LinkedIn but only succeeded in sending a connection request. I’m playing Peter McColl in Katie Morag up on Lewis. Great scripts by the way, you guys have done a cracking job! I’ve got a script query, I’m just after a wee clarification really (ep 3, which we’re filming this week) which it’d be great to run by you? Can I email you privately? Hi I found a monologue from your script Loose Ends, and i want to do the monologue for competition in I.T.S. (International Thespian Society) But I need a script to be able to compete. Could you give me some links as to where I can buy your script. If you could this would be really helpfully! The script was published by Nick Hearn Books. If you google that and my name it should give you the title of the book. Hope this helps. Hey I did google Nick Hearn Books and your name with it and i still couldn’t find a place where i could buy it. Do you know of anything else i could do? I am hoping I can find it soon because i really want to perform it!